In the First Hour Host we will be covering the recent chaotic events brought on by the teachings of the Frankfurt School Marxists. Their mission has always been to establish a Greater ... See More Israel ruled by globalism under the direction of Talmudic Noahide Law and at the same time force all other nations to surrender their independent sovereignty. 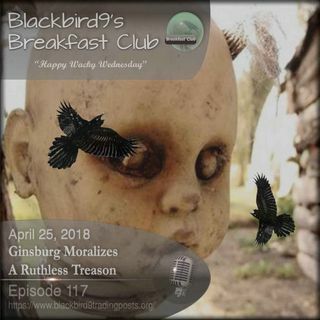 In the Second Hour, Ginsburg Moralizes A Ruthless Treason, we will look at the career of U.S. Supreme Court Associate Justice Ruth Bader Ginsburg. From the earliest Throwing-The-Bones Chance based systems of our T4-Silver Era (16,000 - 10,000 B.C. ), to the Fate based systems of our T3-Copper Era (10,000 - 4000 B.C. ), to the earliest Law Of The Land systems of Hammurabi and Moses of our T2-Iron Era (4000 B.C. - 2000 A.D), to the Magna Carta of 1215 A.D. , to The Great Experiment of Self Rule of 1776, to the appointment of Ruth Bader Ginsburg to the U.S. Supreme Court by President Bill Clinton in 1993 the host examines the fundamental conflict between U.S. Constitutional Law and Jewish Talmudic Noahide Law that is personified in the legal manipulations of (((Ruth Bader Ginsburg))). No one can serve two Masters . . . Whom does Supreme Court Associate Justice Ruth Bader Ginsburg serve?